A wheel alignment consists of adjusting the wheels of your vehicle so that all wheels are parallel to each other and perpendicular to the ground. The front and rear wheels on your vehicle should always be perpendicular to the ground and parallel to the tire beside it. Routine wheel alignments can save you money in the long run by keeping your vehicle running at its optimal vehicle performance, and keep your vehicle running safely and efficiently. Wheels out of alignment can lead to more serious and costly problems, and unsafe conditions. The ASE certifield alignment specialists at Four County Import Service have years of experience in alignments on all makes and models of vehicles. 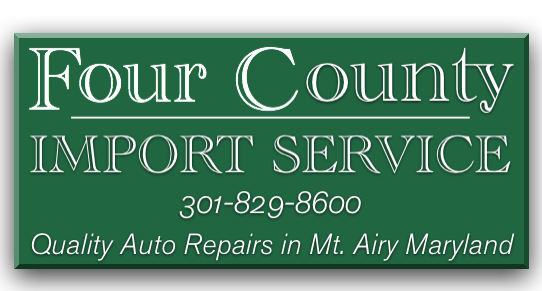 Four County Import Center serves Mount Airy, MD and surrounding areas in Montgomery County, Howard Count, Frederick County, and Carroll County with quality alignments. Give us a call at 301-829-8600 or stop in today!